Something really got to Broncos running back Knowshon Moreno on Sunday. The tears seem to shoot out of his eyes … strange, right? More than one person thought so. What could make Moreno so upset? Or are those eyedrops? I hope, for his sake, it’s eyedrops. 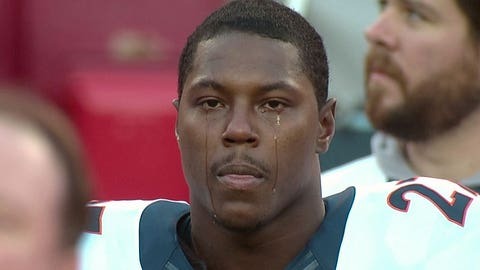 I'd like to see Knowshon Moreno listen to Adele.